The Kiss Stamp -- A Kiss You Can Reuse! The Kiss Stamp — A Kiss You Can Reuse! Want to leave a kiss without smearing your lipstick? 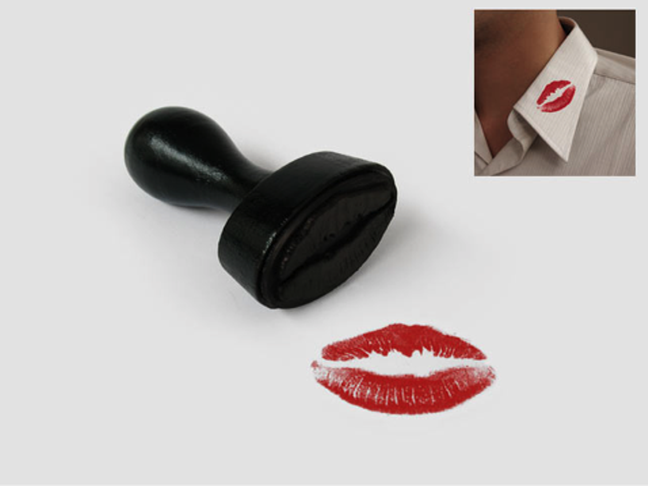 Check out this lipstick kiss stamp from French designers Atypyk — a cheeky twist on the lipstick on the collar. French design company Atypyk specializes in tongue-in-cheek humorous products, providing refreshing twists on traditional products. Their Kiss stamp does just that; sealing it with a kiss has just re-entered the equation. The Kiss stamp is made in France from wood and natural rubber, just the right size for a realistic kiss look. Leave it on lunch notes, sweet reminders, or your husband’s collar — it’s sure to bring a smile. It will look like the real thing, without sacrificing your makeup. You can purchase the Kiss stamp from Atypyk for 19 euros, about $26.